Data-driven Infographics are often used in management and marketing to visually represent data making them easily understandable at a glance. Data-driven Infographics can contain bar graphs, pie charts, histograms, line charts, e.t.c. The PowerPoint presentation of large amounts of data in a graphic format can be very informative and helpful. Find out the Data-Driven Infographics solution in the Solutions panel. Doubleclick the preview of Data Driven Infographics template to open the template in ConceptDraw DIAGRAM. To move value labels or to change bar width and space between bars use control dots. You can add an additional pages to a document using the context menu of Page Navigator (menu View). Export your multi page diagram to MS PowerPoint® presentation using the Export option from the File menu. 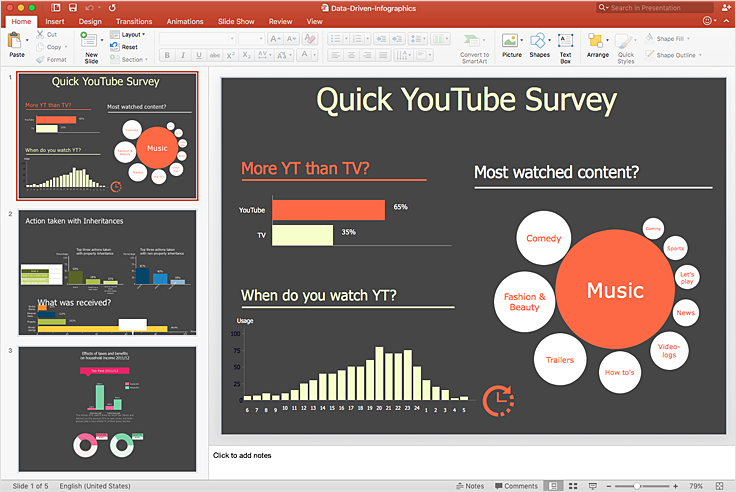 Result: ConceptDraw DIAGRAM allows you to make a MS PowerPoint Presentation from your Data-driven infographics in a few simple steps.